OK, this is a "boomer" blog; here are the inevitable reminiscences of the late '60s. My friend Michael Simmons wrote this piece for the New York Times "Local" blog about Tuli Kupferberg, the East Village Other, and those special late '60s years when he was in middle school and I was in law school. 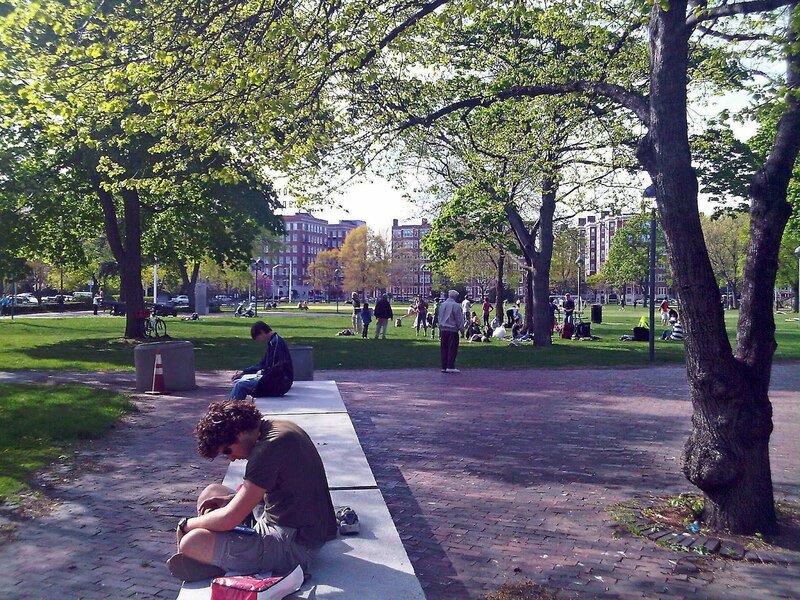 I wasn't in the East Village, or Haight-Ashbury during that time, but I was in Cambridge, Massachusetts, which was a scene of sorts. I'll never forget going to J.Press on Mount Auburn Street to buy a suit in the spring of 1970 (still very much part of the '60s in my opinion) the day after a big antiwar riot. When I got there, the windows had all been smashed and replaced by plywood, but a sign taped to the door said "We're open." As I was trying on a jacket, I said to the middle-aged man who was helping me, "It looks like you bore the brunt of the attack yesterday." "Oh, yes sir, " he said. "I was here through the whole thing. These people were the very scum of the earth. You could tell by the way they were dressed." I also remember balmy spring weekend afternoons on Cambridge Common (see photo, taken in 2010; the place never changes), listening to long forgotten bands like Walk on Water, Clear Light (all the way from L.A., and with an album on Elektra! ), and The Ill Wind. Perhaps my quintessential memory from that time was the Sunday morning on the Common when I saw five or six girls of about age nine or ten, probably Harvard faculty brats, dancing in a circle and chanting, "Christ ya know it ain't easy, ya know how hard it can be; the way things are going, they're gonna CRUCIFY me!" (all fall down). Hardly have position players arrived for spring training (though one annoyed the manager by arriving on time) than owner Jeff Wilpon rubbed star third baseman David Wright wrong by passing out shirts emblazoned with the logo of the strength-through-haplessness 1960s comic character Underdog. Count on the scribes finding lots more contretemps in Port St. Lucie before spring training is over. 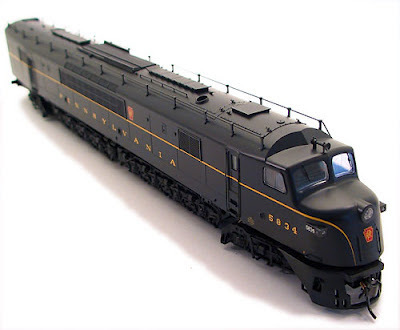 Indeed, the Baldwin DR-12-8-1500/2, as it was officially named, was sometimes nicknamed the "Babyface." It was more commonly called the "Centipede" because of the twelve-axeled phalanx of directional and driving wheels that undergirded each unit's body. Baldwin Locomotive Works was one of the most successful builders of steam locomotives, but had difficulty making the transition to diesel. 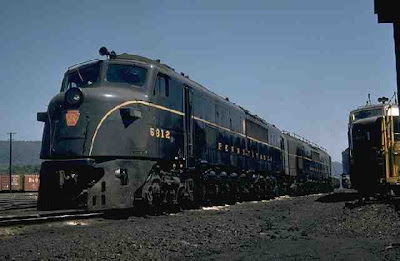 The Centipede was its first serious attempt at a road (as opposed to switcher) diesel. The location of Baldwin's plant, at Eddystone, Pennsylvania, made the Pennsylvania Railroad a logical customer, and it was one of only three roads (the others being the Seaboard and the National Railways of Mexico) to buy Centipedes. Unfortunately, they proved too unreliable for regular train service (the one I saw at Tyrone in 1954 must have been near the end of its days pulling trains) and they were relegated to "helper" duty, providing added rear-end power to trains heading west from Altoona, going around the Horseshoe Curve and up through the Gallitzin tunnels to the top of the Allegheny Plateau.